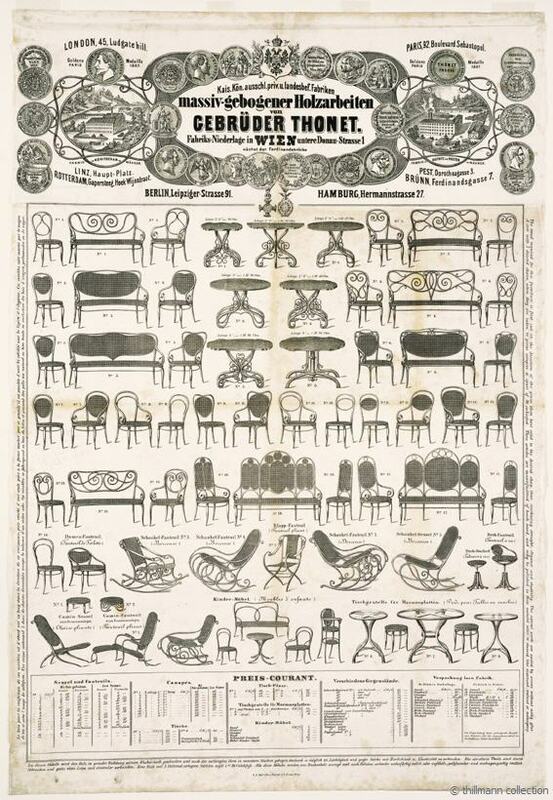 The 1867 sales poster contained all of the essential information that can be found in the later sales catalogues. As in the later sales posters and catalogues, special attention is given to the most recent award received, in this case the gold medal awarded during the 1867 World Exhibition in Paris. Next to it, the factories in Corycany and Bistritz are depicted. The branch-stores in Vienna as well as those in London, Paris, Linz, Rotterdam, Pest, Brünn, Berlin and Hamburg are mentioned with their respective addresses. 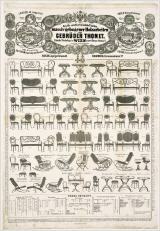 The furniture pieces were now marked unambiguously: chairs, armchairs, sofas and tables are each indicated by a number, other items of furniture have unique names such as „Damenfauteuil“ [lady’s armchair], „Drehstockerl“ [revolving-stool], so that no misunderstanding could arise during orders. The sitting furniture with the numbers 1 to 6 and 13, 16 and 17 is depicted as a group, consisting of chairs, armchairs and sofas. Item number 9 could also be purchased as a group, but the sofa was only listed in the price list. Except for the items nos. 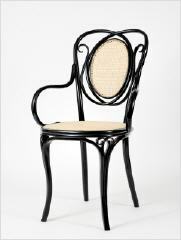 16 and 17, all sitting furniture was available either caned or upholstered. In total, six different models of table were offered. The dimensions of the tabletops were indicated both in inches and centimetres. Table no. 6 could be bought separately, either as a console-table or as a extendable dining-table, but is depicted only in the version with fixed tabletop. Stands were also available separately for all six models, so that they could be combined with a specific tabletop as desired. For table models nos. 7, 8 and 9, only the stand and frame were available. These models were specially designed for marble tops in various dimensions. The price was printed for the first time, in a section called „Preis-Courant“ [price news] at the bottom of the sales poster. The delivery costs were also displayed in a separate column. The margins contained information in German, English and French on the specific production method of each piece of furniture, indicating the resulting advantages, the saving of space during delivery and the various stain colours in which all furniture items were available.